An aneurysm is defined as a persistent, abnormal dilatation of an artery to 1.5 times its normal diameter. A thoracic aortic aneurysm can involve the ascending aorta or aortic root (60%), aortic arch (10%), descending aorta (40%), or thoracoabdominal aorta (10%) segments*. Whilst thoracic aneurysms are less common than abdominal aortic aneurysms, they are associated with high mortality. They have an incidence of 6 in 100,000 person-years, with an increasing prevalence with age. *This classification is important because aneurysms in different locations present with different symptoms, and have different levels of surgical risk. 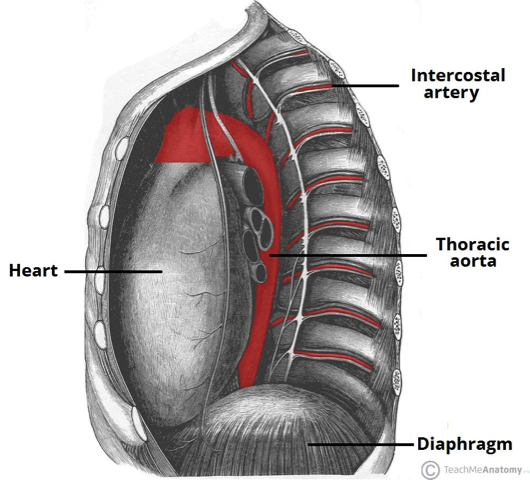 Thoracic aortic aneurysms develop due to degradation of the tunica media, the layer of the artery which provides tensile strength and elasticity to the wall. As a result, the artery loses structural integrity and dilates, and as the diameter increases, the wall tension rises and further increases the diameter in a vicious cycle. Marfan’s syndrome or Ehlers-Danlos syndrome. Thoracic aortic aneurysms grow at a mean rate of 1-2mm/year. This rate is higher in those with Marfan’s syndrome, descending aneurysms (compared to ascending aneurysms), and a dissected aneurysm (compared to a non-dissected). The main risk factors for developing a thoracic aortic aneurysm include family history*, hypertension, atherosclerosis (specifically descending aneurysms), smoking, high BMI, male gender, and advancing age. Typically thoracic aneurysms are asymptomatic and are found incidentally. Clinical signs are not commonly found on examination, however chronic disease may present with the signs of aortic root disease or heart failure. As thoracic aneurysms are mostly found incidentally on imaging, other differential diagnosis are rarely considered before the definitive diagnosis is determined. In symptomatic patients, the scope of symptoms for a thoracic aneurysm is wide. However for those presenting with chest or back pain (the most common presentation), diagnoses of ACS, PE, pneumothorax, and aortic dissection should all be considered. Thoracic aneurysms are diagnosed through imaging. However, initial in-patient and pre-operative testing should include routine bloods (FBC, U&Es, clotting) with a group and save, ECG, and CXR performed. Many thoracic aneurysms are first identified as incidental findings on imaging. A CT chest scan with contrast is the preferred imaging modality for thoracic aneurysms, providing sufficient detail to ascertain the level and the size of the aneurysm*. Transoesophageal echocardiography (TOE) can be used to good effect to further detect any concurrent aortic insufficiency or dissection; TOE should form part of the routine assessment of patients with Marfan’s disease and suspected thoracic aortic disease. Figure 2 – X-ray of a thoracic aortic aneurysm. A – Arrow marks the lateral border of the aorta. B – after endovascular repair. Despite limited evidence, patients with a confirmed thoracic aneurysm should be started on medical management*, alongside any concurrent further investigations and definitive management planned. These patients are at increased cardiovascular risk, therefore should be initiated on statin and antiplatelet therapy to decrease the risk of myocardial infarction. Blood pressure should be controlled and smoking cessation is imperative. *There is some evidence that suggests beta-blocker therapy in patients with a Marfan’s related thoracic aneurysm can slow the rate of growth, but this has not yet been extrapolated into otherwise healthy patients. Development of a second aneurysm is not uncommon in these patients post-intervention, so ongoing imaging studies as an outpatient are required following surgery, either with CT or MRI. Recent studies demonstrate a perioperative mortality of between 2-17%, with arch aneurysms having the highest mortality, at 25% mortality. Mortality is significantly lower in those undergoing endovascular repair. In patients who are monitored prior to surgery, the annual risk of rupture or dissection is 2% when <5cm, 3% for 5-5.9cm, and 7% for those 6cm or above. 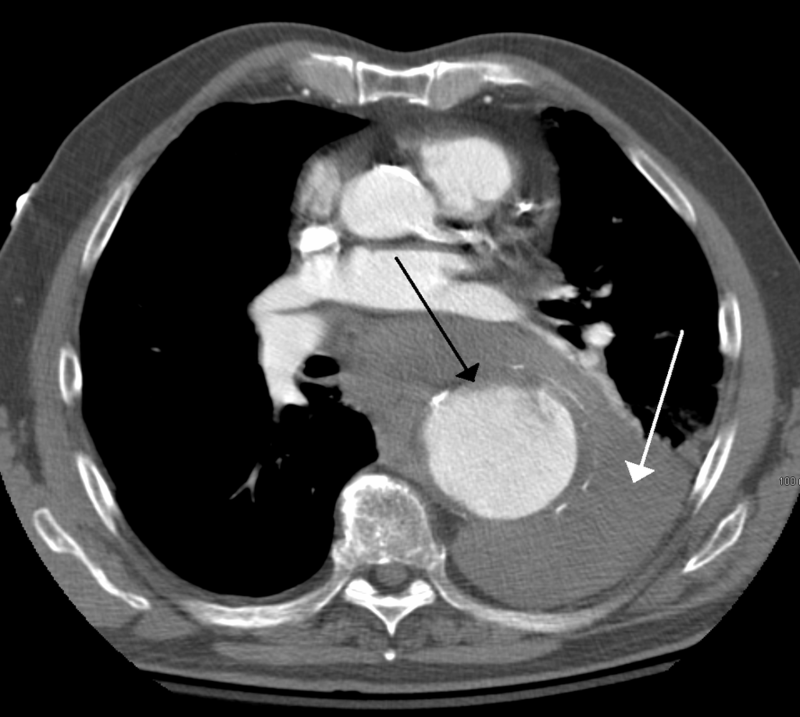 Figure 3 – Contrast CT scan demonstrating a 7cm thoracic aortic aneurysm (black arrow), which has ruptured. The white arrow demonstrates blood in the thorax. Which of the following is a known underlying cause of thoracic aneurysm development? What is the most common presentation of a thoracic aneurysm? Which of the following imaging modality is not routinely used as work-up for a thoracic aneurysm? A 54yr old man is diagnosed with a thoracic aneurysm involving his ascending aorta. Which of the following medication is most likely to be started for him? He is otherwise well, has no other past medical history, and is asymptomatic.